The events of the game based on the events of the book series by George RR Martin and the TV series produced by HBO. After a brief review of the previous episode of Game of Thrones, we as Asher in Yunkai. We are entering an empty tavern and welcome our companion. We study the space and begin to drink. Behind the counter is a gagged person on whose head is a bounty. A battalion enters the room and gives us half the bounty for the prisoners. While we think they slaughter from them and a fight. The leader is down and we crush his knee. More troops come in and take us as then our uncle comes to rescue. Then we flee. As Rodrik believed dead we wake up on a cart full of corpses. However, we lack the strength to draw attention to ourselves. The corpse beside us we turn around and see our dead father. We reach Iron Rath, but the driver is rejected. With his last strength we manage to fall off the wagon and to draw attention. From Maester we are patched, but we awaken. We drink once again an anesthetic, as our mother assails. We awaken by the singing of Talia. We move the pitcher to get her attention. After a hug, she tells us what happened to Ethan. We decide on the meeting of the Council to go small, but fall down when getting up. Talia offers us a helping hand, we accept the same. With their help, we are on the way. Gared is on the way to Castle Black. We enter the fortress see us shortly, as a guard greeted us. We ask for the leader and forwarded to frost fingers. We start the conversation with him. We hide our name him, but he knows it because of the letter from Duncan already. He points us in and show us our clothes. Rodrik and Talia are already in the court of Iron Rath. We move past the Whitehill guards while they badly talking. However, a soldier presents himself in our way. We tell him to take off, he then finally makes emphatically. We concur with the small Council and are immediately greeted friendly. As a new Lord we need to make some decisions. We will choose the Glenmores to ask for help; precisely Lady Elena, our fiancé. Another problem is the soldiers. There are several options to deal with them, but we decide on a diplomatic manner and to keep them quiet. However, this has no significant influence. Again, we find ourselves caught with King and write as Mira wedding invitations for Margaery. The latter leaves the room and we could write a letter in his name in favor of our family or other wedding invitation. We opt for the latter. Then burst purely sera pick up the letters. Meanwhile, Gared joins the roll call. The two begin to discuss. We can talk about it and when we get caught, we take the blame. This could be useful to us. We shall now prove the morning in sword fighting, archery and strength training. While we do that we are being watched by Frost fingers and John Snow. However, this training is fairly simple and does not constitute problems. Meanwhile, Cotter told us that he stole the dagger of Finn. Later Cotter noted that lacks the dagger. He attacks Cotter. We cover Cotter and beat us with Finn. We follow John Snow. Then we are back in the garden of Kings Landing. Sera has stolen a wine amphora of Cercei. She offers us a sip, but we refuse. 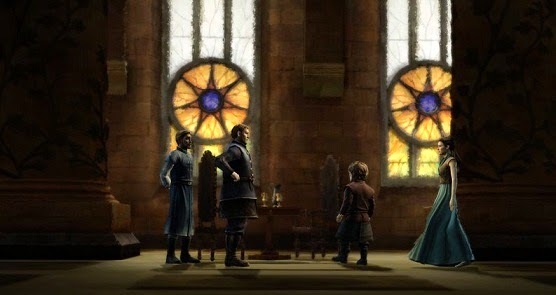 The decision makes no difference, because we are caught by Tyrion Lannister. We enter the negotiating room with Tyrion. The other interlocutors who are men of Whitehill be prayed to go. The trial begins and we offer to provide as much Ironwood. Then we leave the room. Asher, Beskha and Malcolm have to leave the city. We decide Mereen direction to go. Through the streets guards are wicked and we have to hide, but not discovered. Then we leave the city. Mira is, however, on the way to her room. Everything was ransacked and stolen letters. On the bed there is a piece of paper with an invitation to a secret meeting at midnight in the gardens. Rodrik is preparing for the meeting with his Promised. We should try to convince them to adhere to the wedding vows. Failing this, the effect not listed in this episode. During the call, we try to be as honest as possible, but feared that a wedding is best for her family was not as we act weak. Then Whitehill has in the hall. Whitehill offers us during the conversation to kiss his ring. If we assume that he can Ryon our brother for burial. However, we reject as we try to be strong. He then leaves the hall. Gared and John Snow boot are going to the elevator on the wall. He asks us from the event in the Twin Towers. He warns us that we may be in danger. After looking over the wall we return. Meanwhile, Mira is at night in the garden of Kings Landing. By this patrolling guards. We are caught by a Lannister guards and try out persuade us. Be taken forward by the guard Damien's defense. We start a conversation with him, since he was the person who left a note. Suddenly he begins to attack us. We defend and hit the dagger from his hand. He begins to choke us, as the carbon boy attacks him. We take the dagger and attack him in order to save the cabbage boy. Then take away the corpse. We are forgiven and decide to keep the dagger. The torches are lit for the funeral, when Gwyn Whitehill approaches the place. She tells us that she has come to express her sympathy and to tell us about our brother Ryon. She tells us that our brother is very sad and feels let down. Our mother is away. We approach her, comfort her and talk to her courage a fight on. We need to speak our speech for the dead. Depending on the answer option we choose, as well as the final song of Talia will be what in the end of the sounded episode.